Thanks for posting giveaway! 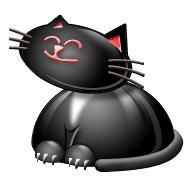 How do you like black kitty icon? I couldn't find one that looked close to Chaos and May, unfortunately, so had to go with this one. It's fun! :) The shape is Chaos, but the happy expression is pure May.